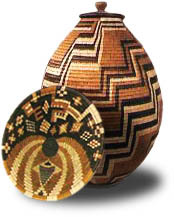 On this page we will list some of the Wayeyi traditional arts products. The main producers of baskets are the women of the Wayeyi and Hambukushu tribes in northwestern Botswana in Gumare and Etsha villages. The closed baskets with lids are used for storing grain, seeds, and sometimes sorghum beer. Large, open bowl shaped baskets are used by the women for carrying items on their heads and for winnowing grain after it has been threshed. The Wayeyi would beat drums, clap hands and sings loudly during the ceremonial times as some form of celebration! 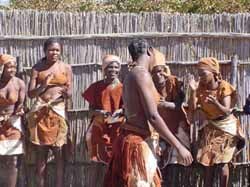 The wayeyi dance is unique to both other african tribes and the western dance. To view the dance Click here!